Kelley Blue Book, or kbb.com, has its roots in the Kelley Kar Company that was founded in 1918. In 1926, this company published a Blue Book, where they offered a complete guide on determining a car’s value. Since then, Kelley Blue Book has become the absolute standard in providing information on what a car is valued at in the current market, at all conditions. The website was launched in 1995, and was later purchased by AutoTrader. If you were to take your vehicle to a car dealership and ask to trade it in for a new one, chances are you would hear the term “blue book value” thrown around. This term is actually a reference to the value of your vehicle that can be found on Kelley Blue Book’s online database. The resource has become so synonymous with accurate information for car values, it has entered the lexicon of car sellers everywhere, permanently. The Kelley Blue Book website can be used for a wide variety of purposes. Look up the value of your car before you consider selling or trading it in. Look up the value of a used car you are considering buying. Look up the value of a car you want to see if you can afford the standard market asking price. All of these needs are met with Kelley Blue Book. You can see price information on new, used, and certified vehicles. You can choose to narrow the field by including information on the year, mileage, special features, damage, or any other detail that can affect the price. And instead of being given a single number, you actually see a range of high to low, as well as the average, price that a vehicle is valued at. Kelley Blue Book offers many more features, such as safety information, expert reviews, and manufacturer specs. They don’t have quite as many informative fields as Edmunds.com, but they come very close to rivaling Edmunds for vehicle information. 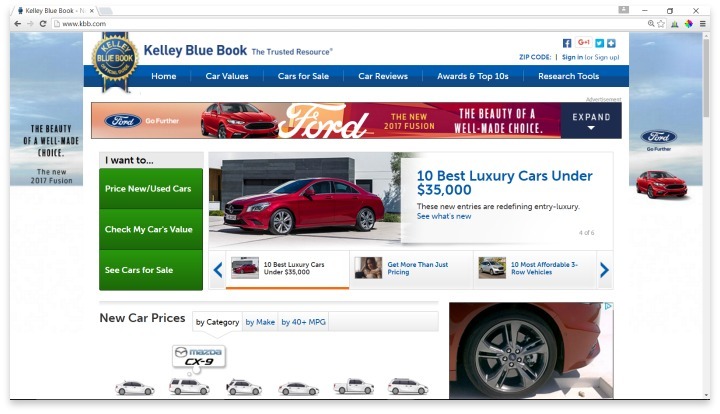 Kelley Blue Book also connects users to specific listings for local dealerships, and links to CARFAX so you can instantly buy an auto history report for a specific listing. One of the best things about Kelley Blue Book is that their website is very easy to use. The focus is on the search function, which starts users off by narrowing what they are looking for, and then asking them to provide more detail till they arrive at the specific car in question. Kelley Blue Book offers a FAQ section, and an online contact field for customer support. Kelley Blue Book is mostly a research tool and car review website, but they do offer private individuals the chance to list their car for sale. There are three different routes to explore, but a starting advertisement is $20 for four weeks, and includes five photos. That is more affordable than AutoTrader, and connects a seller to one of the most well-known websites there is for car shoppers. Kelley Blue Book is the absolute standard in providing information on what a car is valued at in the current market, at all conditions. If you don’t really know what you want yet at all, you may want to start with a competitor that offers a less focused search feature. With Kelley Blue Book, you really need to know what you are looking for to begin. But once you have narrowed down your car choices to a few main options, Kelley Blue Book is the place to search for detailed pricing information. And if you are trying to find the value of your own car for trade-in or sales purposes, Kelley Blue Book is hands-down the best resource. Have you had an experience with this company? Please share your Kelley Blue Book Reviews below. First time i used the site I got everything I needed. Just followed the flow. If you are looking for a used car i recommend it. Be sure to order a current vehicle history report through carfax as well if the seller does not already provide it.